The Lanyard assembly provides fall protection, reducing accelerative loads by its integral, stitched webbing type, shock absorber. In the event of a fall, this minimises the force on the wearer's body. Two, large size Karabiner hooks enable climbing and position changes without risk from ever being unattached to a secure anchorage. Especially useful to scaffolders, steel errectors and rescuers, working at height, the lanyard assembly can span two Metres and may be used with many types and styles of connectors and safety harnesses. 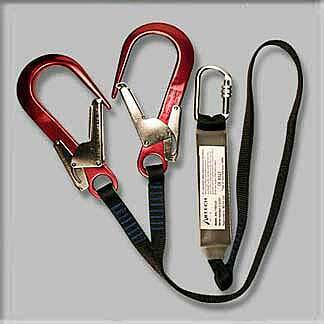 When required for use in confined spaces, where short drops are anticipated, or where, for example, the user needs a short tether point to a crane cage, the assembly can be used without the shock absorber, by afixing the harness Karabiner through the adjacent, webbing loop, instead of the usual fixing point for the shock absorber: thus 'by-passing it. This method allows free movement of about a Metre, on each webbing arm. When using stitched webbing type, shock absorbers; bear in mind that the shock absorber web, unrestrained, will extend by up to a Metre; meaning that the total free fall distance will be up to two Metres. Hence, should the distance above the ground be less than two Metres, the use of such shock absorbers may result in a fall to the ground! Click the button below to add the Twin Lanyard with Scaffold hooks & shock absorber, Abtech to your wish list.